In this section, you'll work with both the history brush tool and the art history brush tool. By using them in the same task, you'll get a better idea of the differences between them. Your goal here is to make the flow of color between the highlights, body, and shadows of the tree branches more subtle, as if it were a watercolor painting. 1 In the History palette, click the New Snapshot button (^j). A snapshot state, Snapshot 1, appears at the top of the History palette. 2 At the top of the History palette, click in the empty box at the left of the Snapshot 1 thumbnail without actually selecting the snapshot. An icon (■■>0 appears in the box, indicating that Snapshot 1 determines the source pixel state you'll paint into the current state of the image. 3 In the Layers palette, select the Outline layer. 4 In the toolbox, select the art history brush tool ( ■-'), hidden under the history brush tool (:■*). 5 In the Brushes palette, choose a small brush size (such as Hard Round 3 Pixels). Then, for Style in the tool options bar, choose a style from the pop-up menu (or leave this at the default setting, Tight Short, as we used in the example). Important: Be sure that the most recent state is still selected (highlighted) at the bottom of the History palette list, or select it now. 6 Using the art history brush tool, paint over the entire tree to smear and blur the outline. You can also experiment with just clicking on an area rather than dragging. When you finish applying the art history brush tool, your image is probably a little more smeared than is ideal. You'll use the history brush tool to remove some of the strokes you made with the art history brush tool—without affecting other areas that you want to leave looking smeary. 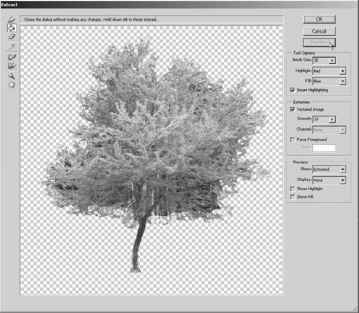 7 Select the history brush tool ( '■'V), hidden under the art history brush tool ( ■-'), and drag the pointer over the areas of the tree where you want to restore the focus to the dark details, such as the smaller twigs and branches, and some areas on the shadowed side of the tree. Notice that the strokes you make with the history brush tool remove the strokes that you made with the art history brush tool and uncover the original dark lines of the image. 8 When you are satisfied with the look of the tree, click the arrow beside the Tree layer set in the Layers palette to collapse the list, and then choose File > Save.